This ridiculous ad was published in the September 1999 issue of One Spirit, the monthly brochure distributed by One Spirit, of Camp Hill, Pennsylvania, a Book-of-the-Month Club affiliate. As far as I know, copper and zinc don't increase circulation, and, even if they could, wearing a bracelet would not cause significant amounts to be absorbed into the body. The idea that magnets "restore the body's energy flow" is also ridiculous. (It might be interesting to ask how the alleged "energy" is measured.) 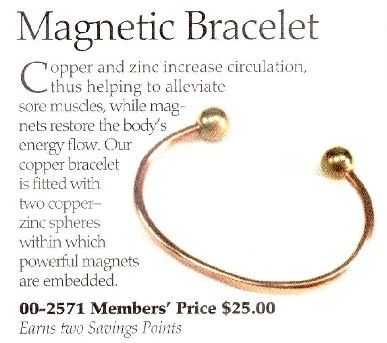 The product appears to be an attempt to exploit widespread hopes that copper bracelets and magnets are effective against arthritis pain. Music for Health and Balance ($39.95) to balance your doshas. Shaman's Necklace ($18) "to dispel evil forces, as well as to attract good luck"
Tibetan Medicine Bracelet and Amulet ($15), made of copper and iron, said to "bring harmony and mental clarity to the wearer." After monitoring One Spirit for several years, I am curious about something. Do the people who select its offerings believe that the methods they promote are effective—or do they simply market anything they think will sell? This article was posted on August 13, 1999.